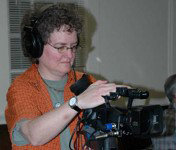 In 2006, Seattle filmmaker Jeri Vaughn accompanied Lee Stripling to the front porches and music halls of Northwest Alabama. There she recorded the reverence felt by Alabamans for the music and rhythm of their roots – and the fiddle as it’s played by the Stripling Brothers in particular. Following Lee and his brother Robert to dances, concerts and the famous family food gatherings, where mashed potatoes, fried chicken and biscuits were washed down by gallons of sweet tea, Vaughn tried to capture what could be the last hurrah of a bygone era of old-time Alabama fiddle music. Some of the music recorded from 1928 to 1936 by Charlie and Ira Stripling, Lee and Robert’s father and uncle, rose from English and Celtic origins and was passed from neighbor to neighbor or by traveling musicians. Charlie’s own compositions reflected the joy that lively rhythm provided for farmers like him, who toiled under the blistering sun in the cotton fields during the Great Depression, when a bowl of black-eyed peas might be the only food on the supper table. Charlie’s story was well told in Joyce Cauthen’s book, “With Fiddle and Well-Rosined Bow,” and his music was carefully recorded for The Library of Congress in 1952 by Ray B. Browne. The 78 rpms Charlie recorded with Ira evolved into longplay albums and now are readily available on CD. After Ira retired in the 1930s, Lee and Robert took his place, riding in a Ford Model A or a Graham-Paige through the night with their father to dances and contests. When the boys left for the Civilian Conservation Corps and later World War II, they expanded their music to include the more modern Western Swing, Big Band sound and the tunes of Bob Wills and the Sons of the Pioneers. Eventually, Lee moved to Seattle and Robert stayed in Birmingham, both raising families and letting their music slip away except for occasional trips back to the old homeplace in Kennedy, where word spread quickly that the Striplings were gathering again. When they revived their sound a half century later, emailing each other with forgotten lyrics, the two former farmboys inspired new generations not only with their music, but with their enthusiastic drive. at the Old Ag Building. Vaughn received partial funding for the documentary from The Library of Congress through the American Folklife Center Henry Reed Fund Award and from the Alabama State Council on the Arts through the Alabama Folklife Association. In interviews in Birmingham, Kennedy and at the old Stripling homeplace, the surviving eight Stripling children told of life as sharecroppers in the 1930s and the pride of having championship fiddle be the family’s legacy. 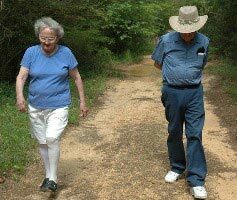 Children and even great-grandchildren of old neighbors turned out in Fayette, Palmetto, Kennedy and other neighboring towns as Vaughn followed Lee and Robert on a reunion tour to document two living legends, by then in their late 80s. A very polished version of “The Stripling Brothers: A Fiddling Legacy” was shown in 2011 in Belk, Alabama near Kennedy. Vaughn is pursuing music rights before official release. Who taught the boys to play? When a visitor left a Gibson mandolin and guitar behind when Lee was 8 and Robert 9 1/2, their mother taught them “Little Brown Jug,” surprising Charlie when he got out his fiddle that night. A month later, the trio won their first fiddle contest.